Ball point sketch - Another one of an advertising sign. 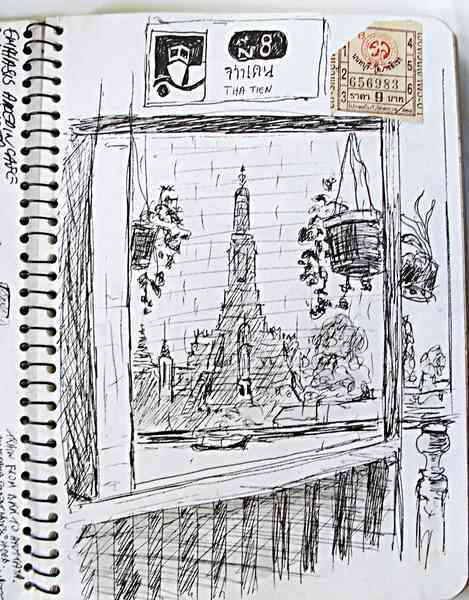 A quick ball point sketch of Tha Tien river boat stop in Bangkok. They pulled a bamboo blind down half way through this sketch, so I finished it through the gaps. The afternoon sun was starting to set across the river. Ball point pen sketching is quick and easy, no fuss, no equipment. It just takes a bit more time to get the shadow sections filled in. 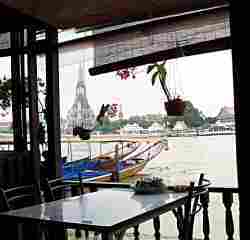 At the top is my version of the riverboat sign and a stub of one of the Chao Praya Express boat tickets. Without a doubt the Express boat service is a noisy, smelly, crowded and uncomfortable way of travel, but I LOVE it. It's cheap and it's unique to Bangkok. Ten times better than being stuck in a traffic jam behind a snoozing cab driver. When I see this sketch I can smell diesel fumes and hear the piercing whistles of the boat skipper's offsider guiding the boat into dock. These guys are good, they have a series of loud piercing whistles from a referees type whistle that tells the skipper when to back off or nudge ahead. They leap ashore with the hawser and before the boat is fully stopped the passengers are leaping the gap to the shore. Great fun! The beauty of ballpoint pens is that they are everywhere. 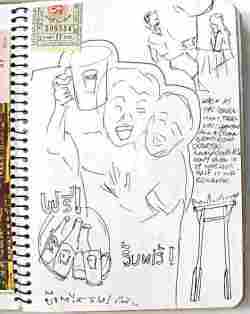 I have some sketches I did in Singapore, without my sketchbook or pens with me. No worries, I borrowed a bit of paper and a pen and kept myself happy for an hour or so. Later on I pasted the paper sketches into my book.